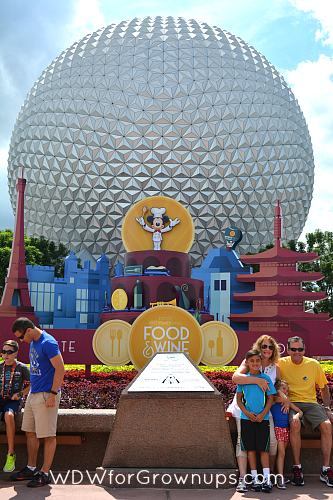 The joys of Epcot on a Festival day are plenty, but the truth of Florida in September and early October means that folks can start to feel a little more spent than expected. With rich foods, lots of booze, high heat, humidity, long lines, and little shade - it's not uncommon to hear of guests that feel ill in the middle of the day. It's OK though, with a little pre-planning you can tour the festival like a pro. Be sure to stay well hydrated drinking water between each beer or cocktail. Don't forget that food is just as important as Drinking Around the World, make sure that you eat. And finally, if you're feeling poorly, find a spot with air conditioning where you can sit down and rest. The following places are some of my favorite. The Festival Center - While this is the never center for Food & Wine Festival guests its out of the way location means that when seminars aren't going on there's ample space to rest awhile indoors. This year the Festival Center is also home to a new movie titled "The Making of The Festival," the Ghirardelli Chocolate Experience, the Wine Shop, Festival Gift Shop, and the Intermissions Cafe where you can grab a glass of wine and something to nosh before finding a table and taking some time to relax. 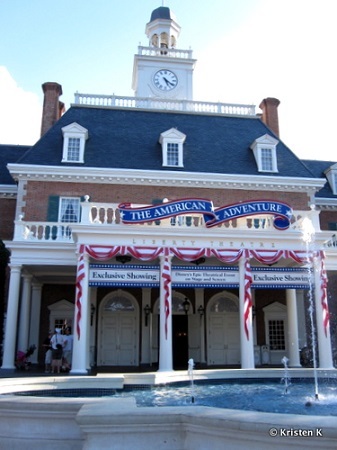 American Adventure (year round option) - At the midpoint of the Promenade, the American Adventure is perfectly situated for a mid-day break. Guests can easily rest 45-60 minutes here watching the pre-show and then main attraction. Located inside the air conditioned People's Mansion, guests will enjoy a pre-show concert by the Voices of Liberty, seating here is very limited, but feel free to claim a patch of floor. Next they are lead into the main theater for a 30 minute show. Exhausted members of my family have even been known to catch a nap in the comfortable seating. Food & Beverage is not allowed in the show building. China Pavilion Pre-show (year round option) - Low bench seating within the Temple of Heaven in the China Pavilion makes for a lovely spot to take a break. Have a seat and enjoy the exotic art while you cool down in the a/c. It's perfectly acceptable to take your time and not move into the main theater if you still need more of a break. Food & Beverage is not allowed in the show building. Two specialty lounges are available in the Park if you qualify for entry. Both offer a relaxing air conditioned spot to sit down and rest in comfort. These semi-private lounges both offer their guests complimentary non-alcoholic beverages, and spot to charge electronics. Chase Card Holder VIP Lounge - 3rd Floor of the American Adventure, show your Chase Card for access to the lounge. 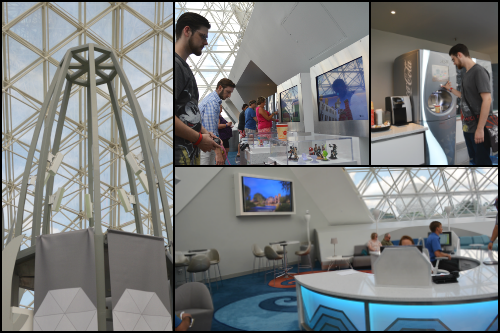 DVC Member Lounge - Upstairs in the Imagination Pavilion, show your DVC Member Card for access. Epcot Odyssey First Aid (year round option) - Located off to the side of the Odyssey building between Test Track and Mexico, Epcot's First Aid Station is staffed by registered nurses, and the Reedy Creek Emergency Response Crew is never far away if you've let things go too far. While the first aid station is NOT a lounge, it is the best place to go if you feel you've crossed into heat exhaustion. Walt Disney World Resorts (year round option) - Guests staying at Walt Disney World Resorts may find a mid-day trip back to the hotel room helpful when the sun is high. For this reason walkable Epcot Resort rooms tend to be rather difficult to come by during the Food & Wine Festival. No matter where your room is, don't underestimate the value of a nap on your overall health. One day's break to cool down and rest may be just the thing that keeps you going for the rest of the trip. The absence of air-conditioned places to take breaks in Disney's Animal Kingdom makes it the least desirable park to visit. In the Magic Kingdom it seems like you're always only a few steps away from an air-conditioned rest. Mid-day floats in the quiet pool are also refreshing. In August we had a pre-park opening reservation at Garden Grill. We were detoured thru Innoventions West to get to the land. Right before you come out, there is plenty of space to sit and take a break! Tiy are right, Animal Kingdom doesn't have many "open" spaces for A/C but they make up for it with shows. It's Tough to be a Bug, Nemo and the Lion King all give you plenty of time to rest up and cool off. Even the Oasis with towering trees and shade provides a "cooler" spot on the hottest of days. I wouldn't write it off as the "least desirable park" because of this.